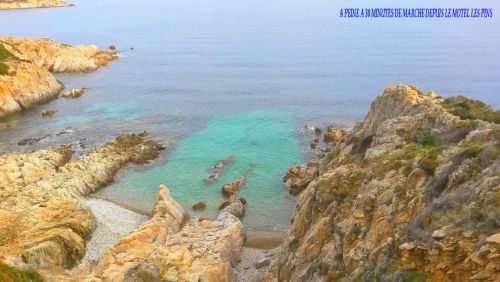 Holiday rental in Calvi: What does our holiday residence proposes you for your stay in Corsica? 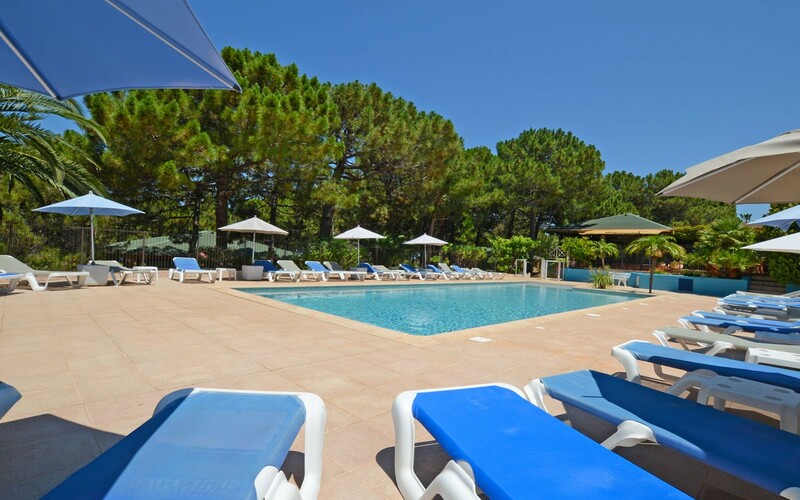 An ideal situation; our residence " Motel Les Pins ** " is just 1.2 km from the city center of Calvi (15 minute walking distance), on the route de Porto by the coast. 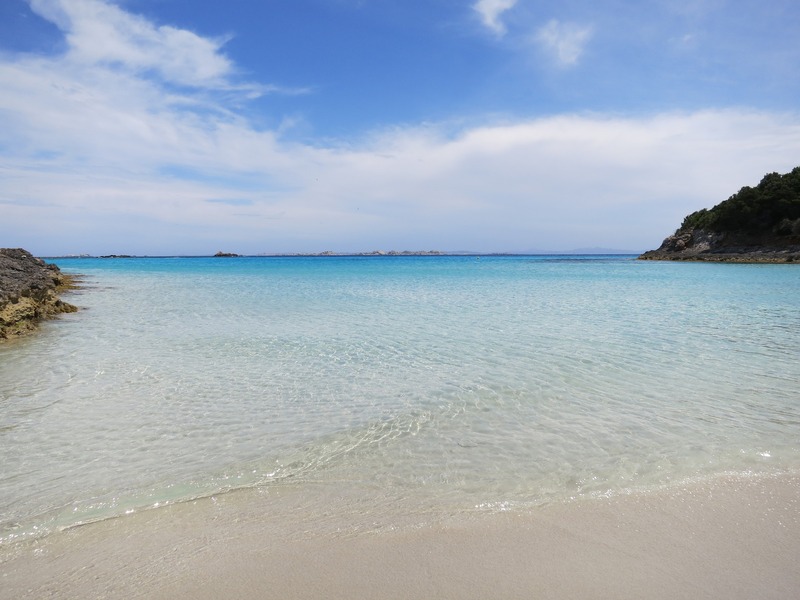 Due to our ideal placement, you will at the same time, be close to all the conveniences that offers our wonderful city of Calvi (shops, bars, restaurants, car-hire, watersports and other activities) and also far enough to avoid the noise of city and have a quiet and relaxing stay. 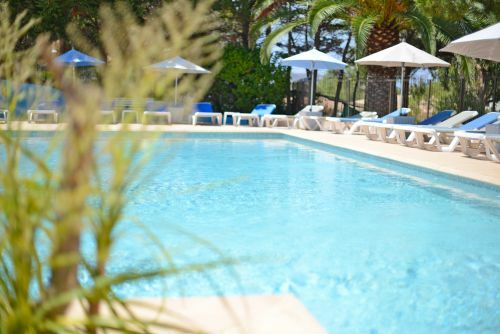 Our residence of holiday rentals " Motel les Pins ** " is the perfect place for your holidays at the sea side. We’re just 500 meters away from the seaside and only twenty minutes walking distance from a magnificent small beach. 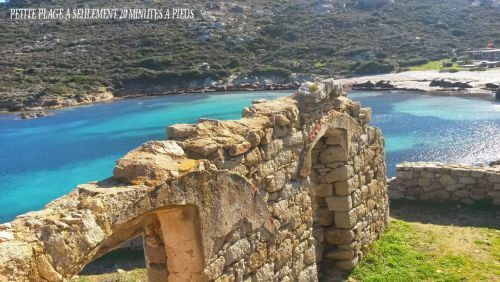 You can reach it by a trail that goes along the seacoast with fantastic views and the wonderful smell of the Corsican scrubland, the "maquis"! From the same path which is only 100 meters away from your holiday rental in the Motel Les Pins **, you can in one and a half hour of walking reach to the magnificent point of Révelatta. Once there you can admire Calvi and its majestic citadel. 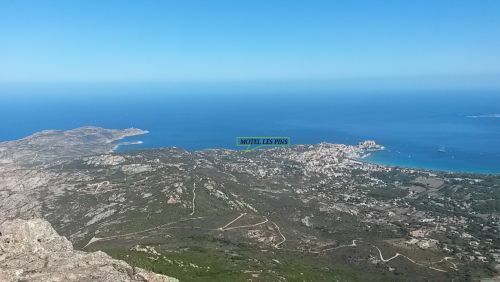 Our establishment Motel Les Pins ** is also at only 2 kilometers away from the very beautiful chapel Notre-Dame De La Serra which dominates and protects the city of Calvi and offers you the most beautiful panorama of Calvi and its bay. The Motel Les Pins ** is therefore the ideal place for whom want to discover Calvi and the surrounding nature without having to take the car. Do you want to stay in an unusual, atypical and natural place? Do you desire to spend your holidays in Calvi under the sign of the Zen-attitude, the peace and the good mood? Then come and discover our holiday rentals. 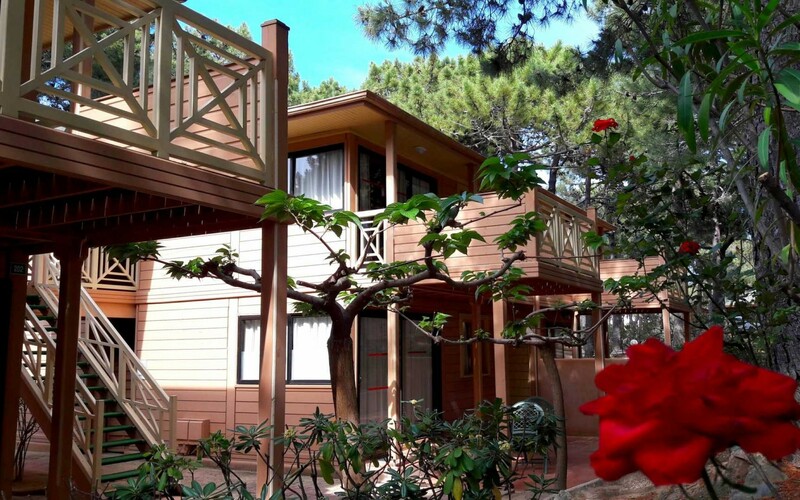 Our residence Motel les Pins ** proposes you its apartment rentals in a special place and a friendly atmosphere with a team always at your service, and which will guide you through your stay. 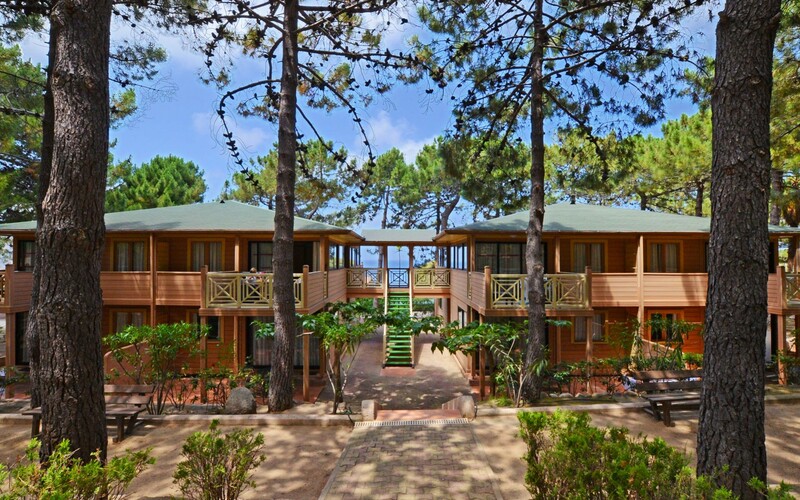 Anchored in the heart of a well-kept pine forest, the Motel Les Pins ** is completely conceived in wood and in a style reminding the Louisiana-style. Its four constructions of eight apartments of 32 m ² each (four in the first floor and four on the ground-floor) are nestled in the middle of the nature, in a fresh, green and restful atmosphere. As soon as you arrive, you will be completely disconnected from the daily stress. 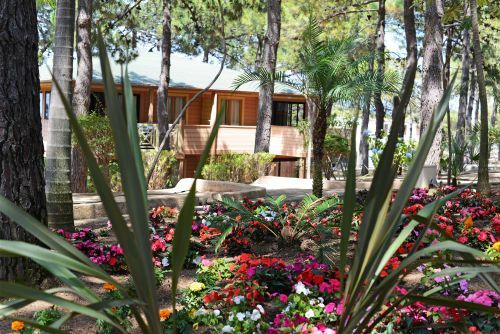 You will be dazzled by charm and beauty of its constructions, its flowery gardens and the awesome mixture between pines and palm trees. 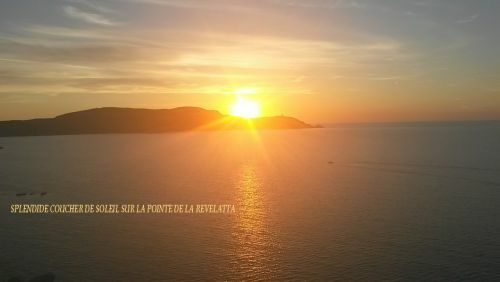 Some apartments even offer you a splendid sea view, and the lighthouse of the Révelatta, with beautiful sunsets. During your stay in one of our holiday rentals you will have the possibility to do diverse leisure activities within our establishment itself. We suggest you to sit by our beautiful swimming pool, which is equipped with sun loungers and sunshades. 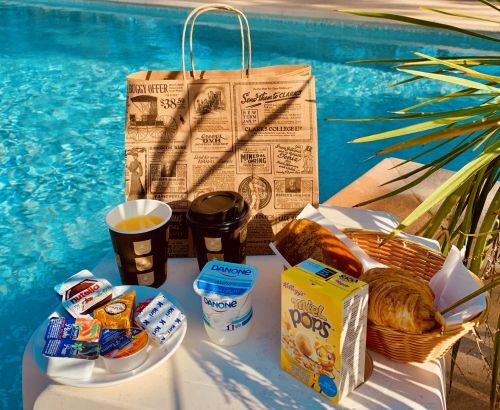 You can also, if you wish so, to have your breakfast or to sip a cool drink installed on our terrace. For your children, there is a playground with a swing-set, two slides and a table-tennis as well as a playroom with table-football and a pool table. If you like the petanques-bowls games in a Provençal-mood you can use our petanque-play area. Everything is gathered at the Motel Les Pins ** so that you can have a pleasant stay in our residence.